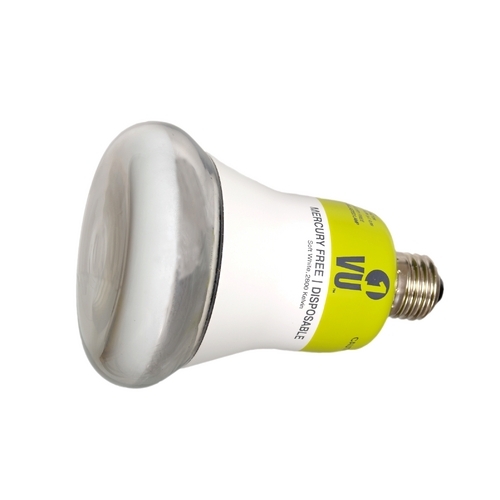 The following are detailed specifications about the R30 Energy Efficient Light Bulb - 19.5-Watts. This R30 reflector light bulb combines the pros of compact fluorescent technology with its long life of 10000 hours with the light quality and dimmability of incandescent bulbs. Comparable to a 65-watt R30 this bulb uses only 19.5-watts. Electron Stimulated Luminescence™ (ESL) Lighting Technology is an entirely new, energy efficient lighting technology using accelerated electrons to stimulate phosphor to create light and make the surface of the bulb "glow". ESL technology creates the same light quality as an incandescent but is up to 70% more energy efficient, lasting up to 5 times longer than incandescent and contributing to the reduction of greenhouse gas emissions. There is no use of the neurotoxin Mercury (Hg) in the lighting process. Can’t find what you’re looking for? Give us a call at 1-800-653-6556 or send us an email at customerservice@destinationlighting.com and we’ll help you find the product. With our 14 physical stores and close relationship with our manufacturers, we are able to provide accurate answers faster than other online retailers. I tried mixing and matching ESL bulbs with Incandescent bulbs attached to a dimmer and they both dimmed at slightly different rates. Personally I preferred the way ESL lighting dimmed at low levels (it didn't color shift like incandescent) but I wouldn't suggest mixing it with other bulb types if your bulbs are connected to a dimmer. The ESL bulb takes up to a second to come to full brightness which is actually a nice feature when waking up at night and turning the light on in a dark room. The second it takes to warm to full brightness gives my pupils time to adjust without making me wait minutes for full brightness like some CFLs do. Excellent light quality, no glare. It's everything it says it is. Excellent light quality with about the same efficiency as a CFL. Soft start is fine; is instant-on for all intents and purposes. Highly recommended! Relatively inexpensice compared to LED and has the best color, this is in my opinion the right replacement for incandesent and NO mercury hazard and is adjustable etc. Just received 1 to give it a try and am very pleased with the quality and color of the light. The light quality is amazing, you can stare right at them, can't do that with a LED bulb. Don't have to worry about breaking them. They are built heavy duty with no mercury. When you dim them they don't turn reddish like other bulbs, they stay the same color just less light. Can't wait to replace the LED bulbs in my living room. Highly recommend them. These guys have finally got it absolutely right. Changing every bulb in the house. Best can light on the market. I've tried them all and this one really has natural light. Highly recommend it. The light is soft and fills the space. Not like a spotlight. Superior light bulb! Cons: flicker if held at 3-5% dim level, but that's unlikely to happen in real use. The bulbs do work great with my Insteon dimmer switches, unlike most LED bulbs which may dim fine, but usually jump off or on while dimmer, even if to/from a dimmed state. I have 4 bulbs in a closet. They work well. Using them for a few months prior to ordering more to watch for issues. I posted a video of them on YouTube. Search for vu1 ESL bulb and it should come up. Feb, 2015. Can't give 5 stars until tested for more than a month. Pros: Beautiful color. Quick on. Dimable. No mercury. Low power usage. Hopefully this is well made and lasts as long advertised. I ordered four for the recessed lights in one room as a test. Three of the bulbs had problems (flicker, popping, dark spot). Destination was great they said we can ship out three replacements or you can return those for your money back. I asked for the three replacements. They said I didn't even have to ship back the bad ones. I like this company! While I like the color, they are dimmer than a 65 watt incandescent. VU1 rates them at 500 lumens and the incandescents I replaced were 650 lumens. I have four recessed in each room. So it is noticeable dimmer. My wife on the other hand HATES them. I ended up taking them out of our room and putting them in my sons room and he is happy with them. He loves the way they slowly come up, as do I. If they were as bright as 65 watt incandescents I'd order another 16 for the rest of the house. I picked one of these up as a fluke. Did not know they existed. My guest bathroom has a fan/flood fixture that I had installed a CFL into, and the CFL was always dim and slow to light. So far the ESL has worked great and looks great. Also no complaint from my family on the light. I hope these catch on in smaller sizes. This R30 Energy Efficient Light Bulb - 19.5-Watts is part of the $item.xCollectionName Collection from Vu1 Lighting. The following items are also part of the $item.xCollectionName Collection.